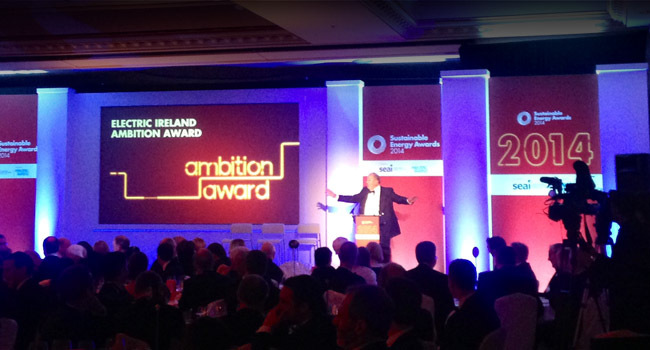 The SEAI Sustainable Energy Awards took place last week at The Shelbourne Hotel and what a night it was. Having designed the presentation and communications, we were delighted to form part of an eclectic mix which included Gavin Duffy (quite the photo bomber), a man in a kilt, the minister, a diplomat or two, our agency friends from SEAI and some of Ireland’s most ambitious businesses. The awards encourage, recognise and reward excellence in energy management and they celebrate individuals, groups and organisations who demonstrate a commitment to include energy management as part of their overall management structure. We were particularly impressed with the worthy winners of the Ambition category Comharchumann Fuinnimh Oileáin Árainn Teo (CFOAT). The group were set up in 2012 and are on track to develop the Aran Islands as energy independent, energy self-sustaining and carbon neutral by 2022. Surely that’s as high as ambition goes!